Introduction: As discussed in our 2007 review of the Sworming Hornet Lure Company's product, bladed jigheads have been part of the fishing landscape for a very long time. 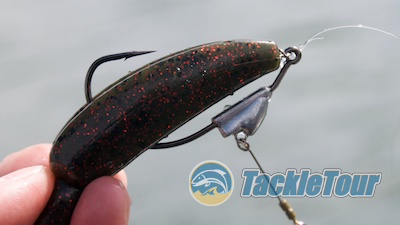 With the popularity of paddeltail swimbaits in the market today, anglers have been searching for method to combine these two items without having to chop the head off of their paddletail baits or fish a lure with four eyeballs. If you've faced this dilemma in the past and are still searching for a solution, Owner's Flashy Spinner product may be just the ticket. 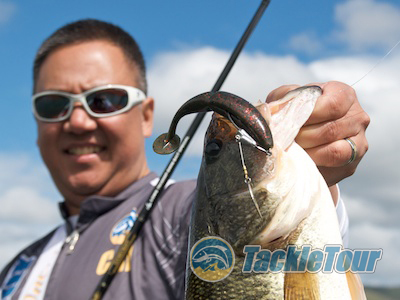 Impressions: Owner's Flashy Swimmer is more of a hybrid weighted hook and jighead design than it is one or the other. The lead weight for this product is located towards the top of the hook shank, but not right at the eyelet. 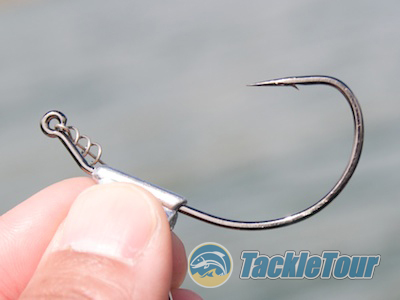 The shape of the lead weight lets the product behave more like a jig than a weighted hook. Throw in the added attraction of a small, willow leaf blade and Owner's TwistLOCK lure keeper, and you have a product that is really suited to spicen up just about any soft plastic bait you feel like attaching to it. It is available in three sizes: eighth ounce with a 1/0 hook, three sixteenths of an ounce with a 3/0 hook and one quarter of an ounce with a 5/0 hook. 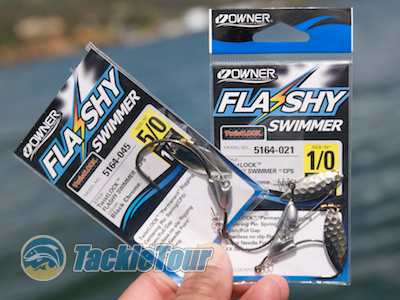 Each package contains two Flashy Swimmer hooks and they retail for right around $6.00 per package. Field Tests: I used the Flashy Swimmer on and off during the course of our testing season in 2010 with a variety of baits from spider grubs to paddletail swimbaits and really liked it best with the paddletails. ... and a weighted head with a small willow leaf blade for added flash. 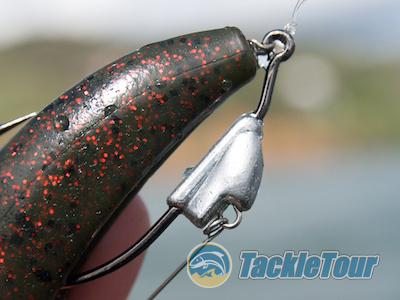 The advantage with this piece of terminal tackle is all in how you rig the bait. 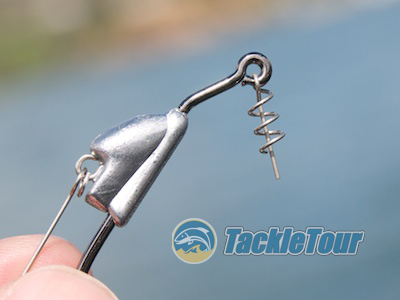 Owner’s TwistLOCK centerpin system is easy to use and allows you to rig your paddletail swimbaits in a very natural position without having to cut part of the head off to fit the bait behind a jig head. 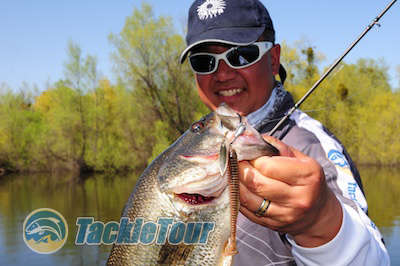 Available in three sizes, this quarter ounce, 5/0 hook size is just right for Sawamura's five inch OneUp Shad. Because the weight is located below the bait’s head, the overall package swims more like a paddletail rigged on a weighted hook. The difference here though, is you get the added flash below the bait as well as you can effectively drag this set up across the bottom like a standard jighead because of the shape of the Flashy Swimmer’s head. 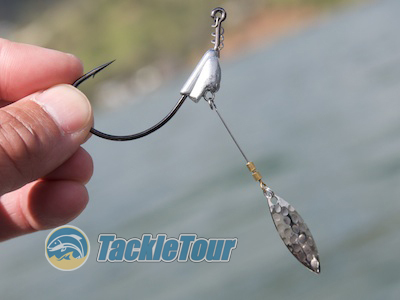 The bait is rigged weedless but the hook has plenty of room to pop out when a fish strikes. This means you can slow roll and crawl your swimbaits on the bottom and the jighead, along with the small willow leaf blade, will kick up a dust trail making it look like your bait is a fish feeding on the bottom, an easy target for any fish looking for a snack. 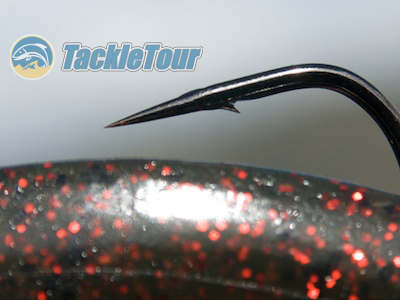 The lead weight has an almost arkie head profile that can be dragged or hopped along the bottom. Also, because your bait is rigged Texas-style weedless, you can pull this setup through weedbeds with little to no problems with hangups. With the rotating blade on the bottom, and any kind of width to your lure, there will always be some weeds that catch your bait, but the effect is minimized with the way the Flashy Swimmer holds your bait. Owner is known for their cutting edge hook points, but the Flashy Swimmer features a needlepoint hook. Hook up ratios with the Flash Swimmer are really good thanks to the proven Owner hook point technology. For the Flashy Swimmer though, Owner goes with a needlenose point instead of the cutting edge point under which they made their name. Nonetheless, we had no problems with the hook point rolling over or dulling prematurely. The hook shank itself is rated as 2x strong. The gap on these hooks is rated as “full gap” so while it’s not extra-wide, we didn’t seem to have any problems with baits as large as Sawamura’s five inch OneUp Shad and as small as Kietech’s three and a half inch Swing Impact paddletail swimbaits. Owner's long history of producing quality product inspires confidence in me with every hook set. 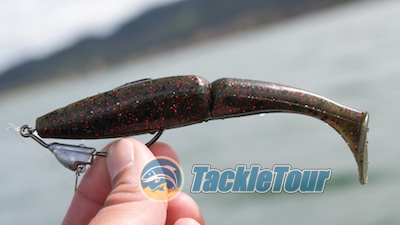 Want to dress up your soft plastics? the Owner Flashy Swimmer is one alternative. Conclusion: With such a simple tackle item as this, there's really not much more else to add. Owner has been a proven manufacturer of quality hook products for over twenty years, so when we see a new hook product in their arsenal, it's almost a no brainer the product will work and work well. The Flashy Swimmer is one such product. All we need is a handful of outings with some cooperative fish to verify and there you have it. If you have the desire or need to change things up with your soft plastics and give the fish in your area something they may not have seen, Owner's Flashy Swimmer is worth a shot.